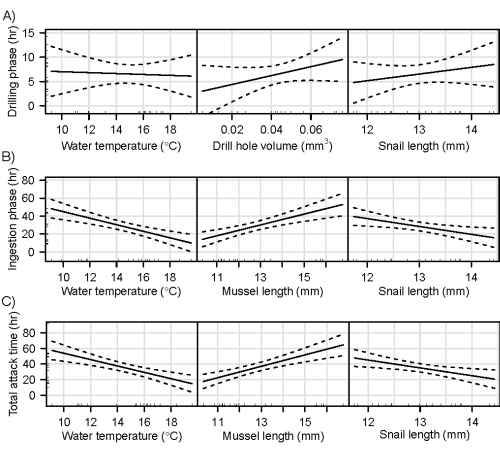 Last year I published a little paper showing how whelks (Nucella lapillus) drill through mussel shells at different rates depending on water temperature. This involved making hundreds of hours of recordings of whelks slowly scraping their way through the calcium carbonate shell of Mytilus edulis mussels in different water temperatures. The video above includes two examples of those recordings from two different snails of the same size, highlighted as red dots on the graph in the video, one taken at a water temperature of 9°C (48°F) and the second at 17.5°C (63.5°F). What you’ll notice is that the whelk in cold water is scraping substantially slower than the whelk living in warm water. The plot in the video shows the strong relationship between the frequency of rasps versus temperature. However, it’s worth noting that just because the rate of rasping changed with temperature, there wasn’t any evidence that the time it took to drill through the shell was actually affected by water temperature (see the model results in the figure below). This may be true for a number of reasons, particularly since the whelks also chemically dissolve away portions of the shell in between rasping sessions, and that chemical dissolution may proceed faster at cold temperatures even if the rasping rate slows down. After a snail finished drilling through the shell, the time that was then spent consuming the mussel was affected by temperature, whelk body size, and the size of the mussel being eaten. A link to the full paper can be found on my publications page (click around a bit, you’ll find it) or the publisher’s site.